Andres Iniesta Lujan is a center midfielder for the La Liga team, FC Barcelona and also plays on the Spanish National Team. Iniesta was born on May 11th, 1984 in Fuentealbilla, Spain. Iniesta’s Soccer career began to flourish at the early age of 12 when he drew the attention of scouts all across Spain while playing for Albacete Balompie in a 7 v 7 junior tournament. Iniesta’s parents were friends with Enrique Orizaola, the FC Barcelona youth coach, and in 1996 persuaded him to let Andres attend the Barcelona youth academy. In 1999 Iniesta lead the Barcelona youth team to victory in the Nike Premier Cup with a game winning goal in the last minute of the game and was ultimately named the player of the tournament. Iniesta continued to develop as a player under the FC Barcelona soccer club, moving up to the Barcelona B squad in 2001 and remained on the squad through 2003. Iniesta made a few appearances as a substitute during the 2002 – 03 season for FC Barcelona and finally became a fulltime member of the squad during the 2004 – 05 season. During the 04-05 season Iniesta played in 37 of 38 games (25 appearances were substitutions), more than any other player on the team, scoring 2 goals on the season. An injury to Xavi Hernandez in the 05-06 season gave Iniesta the opportunity to make more regular starts for FC Barcelona at the center midfield position. Barcelona ended up winning a league and Champions league double in 2006 and coach Frank Rijkaard praised the contribution that Iniesta made to the team that year. The 2006 – 07 season was Iniesta’s highest scoring season on record scoring 9 goals on the season. (He tied this record in 2010-11). Coach Frank Rijkaard moved Iniesta all around the pitch during the season, playing as a left wing for the first time in the Champions League he scored twice against Levski Sofia. Iniesta was able to switch his number from 24 to 8 after fellow teammate Ludovic Giuly left the team. In 2007 there was rumor by the Spanish newspaper Marca that Iniesta would be moving to Barcelona Rivals Real Madrid. Iniesta publically denied the claims stating “I’ve been told about that and I’m very surprised. I cant do anything about it, but I’d like to insist once again that I want to stay here (Barcelona). When I say I want to retire in Barca, I say it with all my heart. And my wishes are above everything else.” In 2008 his contract was renewed firming his spot on the team until 2014 raising his buy-out clause to €150 million. 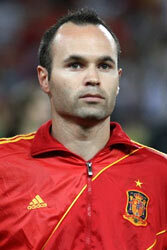 In 2007 Iniesta was ranked the fifth most consistent player by Don Balon, a Spanish Soccer Magazine, and fourth in 2008. He also placed ninth in the 2008 FIFA World Player of the Year voting. Midway through the 2008 season Iniesta suffered an injury to his leg which kept him out of the season from November to January of 2009. On February 5th of 2009, Iniesta made his 250th appearance in a Barcelona jersey in a match against Mallorca in the Copa del Rey (King’s Cup), an annual competition for Spanish soccer clubs. Barcelona went on to win the 2009 UEFA Champions League final against Manchester United with Iniesta playing a crucial role in the game at the center midfield position. Iniesta was a candidate for the 2009 FIFA Ballon d’or along with teammates Lionel Messi and Xavi Hernandez and was one of 5 nominees for the World Player of the Year award. In 2009 Iniesta extended his contract with Barcelona until 2015, and his buyout clause was raised to €200 million. In 2012 Iniesta was once again a candidate for the FIFA Ballon d’or but came in second to teammate Lionel Messi. Iniesta was named the best player of the 2011-12 UEFA Champions League. Iniesta’s ability to create space and find passing lanes serves as a vital part of the Barcelona offense, and will remain one of the greatest players to watch in all of soccer.